Michigan guard Muhammad-Ali Abdur-Rahkman drives against center Alex Olah. The Northwestern junior was a dominant force on both ends against the Wolverines, especially with 22 points on 9-12 FG on offense, but it wasn’t enough to stop another debilitating Wildcats defeat. ANN ARBOR, Mich. — Junior center Alex Olah, who has faced criticism all season, shouldered the load Saturday at Michigan with his best performance of the season, but the Wildcats (10-8, 1-4 Big Ten) fell 56-54 to the Michigan Wolverines (11-7, 4-2). Olah scored a season-high and kept the Cats in the game until the final buzzer. They had a chance to force overtime on the game’s final possession, but freshman point guard Bryant McIntosh missed an open floater. Much like in Wednesday’s loss to Illinois, NU showed some resilience. The Cats faced a 53-49 deficit in the final two minutes, but a 3-pointer by freshman wing Scottie Lindsey and a layup by Olah kept the team alive. The Cats also trailed 25-11 in the first period after allowing an 18-0 run but fought back to take a 32-31 halftime lead. Olah scored his 22 points on 9-of-12 shooting, along with 7 rebounds. The 7-footer took over late in the first half, scoring 11 points in a five-minute span as NU turned its 14-point deficit into a slim lead. Despite his strong performance, Olah was dejected after the game. NU continued to feed Olah to start the second half. The senior scored his 20th point of the night with more than 10 minutes remaining, and the Cats held a 45-41 lead. Then their offense stalled as they failed to get Olah post touches. Michigan used a 7-1 spurt capped by a Derrick Walton Jr. trey to grab their first lead of the second half. Senior guard JerShon Cobb, who started for the first time since Dec. 6, quieted the Crisler Center crowd with a corner 3-pointer. Michigan responded again though, this time with a 5-0 burst. Cobb finished with 13 points and six rebounds. The Cats defense took a step forward, holding the Wolverines to 0.98 points per possession after struggling against Illinois and Michigan State. 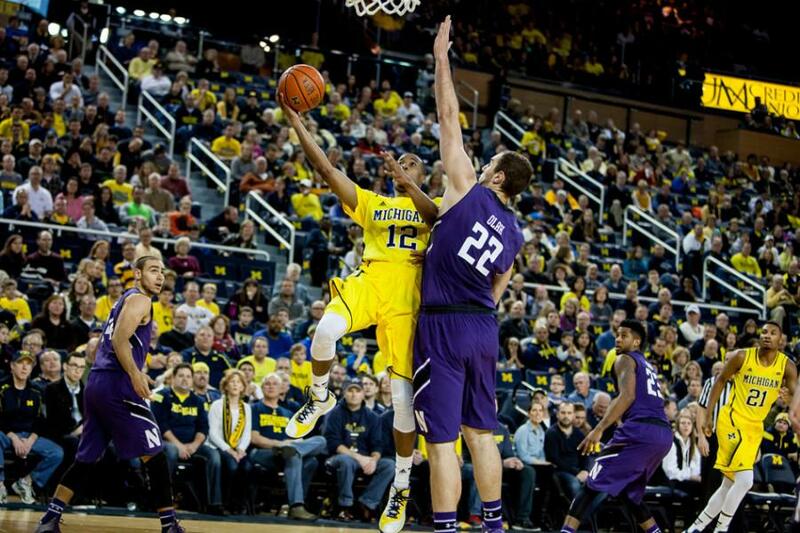 Michigan leading scorer Caris LeVert recorded 18 points, but shot just 7-of-19 from the field. LeVert also had seven assists to just one turnover. “If you can make a guy like that take more shots then he gets points, you’ve done a good job on him,” Collins said. Losing four straight conference games, and three straight by no more than 5 points or in overtime, could weaken a team’s confidence. But Collins said he feels the Cats’ ability to stay close in these games is actually building confidence. Olah, who has seen more ups and downs his career than any other current NU player, shared that sentiment. Correction: A previous version of this story misstated the day of the week on which the game between Northwestern and Michigan was played. It took place on Saturday. The Daily regrets the error.